I was poking around on MyStrands this evening, looking at their measures of reach (a measure of the proportion of people who have listened to an artist in the last week) and I found that the first few artists I looked at had rather boring trends: their reach went up a bit for a month, then down a bit and mainly just oscillated like that around a steady audience size. 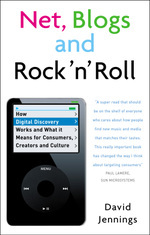 So what artists might show a more interesting trajectory? I thought I'd try the Arctic Monkeys. 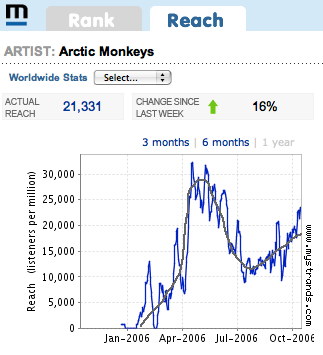 To get the graph on the upper right, go the Monkeys' page on MyStrands and click the link that says "How well is Arctic Monkeys doing?". 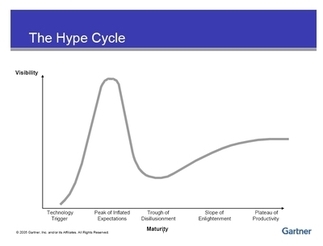 The grey curve on the MyStrands data is something I drew on myself to smooth out the trends in the graph. Because, it looked to me, what we have here is very similar to the Hype Cycle that Gartner use to describe the spread of new technologies: the Peak of Inflated Expectations, followed by the Trough of Disillusionment, and then the steady rise of Enlightenment. There's nothing particularly remarkable about this similarity, and I guess it may not be sustained over the longer term, but it pleased me to discover it. Tell me if you disagree.